Home » Rock Tumbling Library » How much does tumbling cost? 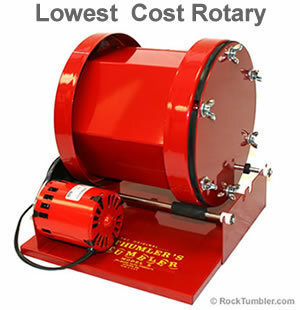 How Much Does it Cost to Run a Rock Tumbler? If you want tumbled stones, maybe you should buy them instead of a tumbler? When you should buy a tumbler! If you are buying a tumbler because you want the satisfaction, experience and pride of producing your own polished stones then we know exactly what motivates you! That's why we own several tumblers of various kinds and run them frequently! Tumbling is also a great activity to share with your children, grandchildren, your spouse or friends. It's a great relationship-builder. When you should buy polished stones! If your goal is to acquire lots of tumbled stones for craft projects, planters or simply to enjoy, perhaps you should consider the cost of buying them compared to the cost of producing them yourself. If you have to purchase the rough, purchase the grit and polish, pay for the electricity, buy a tumbler and pay for its maintenance then the cost of producing the stones yourself might be greater than the cost of buying them. No kidding. The article on the left side of this page shows you the math. Commercial producers of polished stones buy their grit and rough by the ton, they use very efficient tumblers and they are very efficient workers. Their costs are very very low. They also have enough experience that they ruin very few batches and produce exceptionally nice polished stones with a brilliant polish. If we didn't enjoy tumbling our own stones we would be buying them instead. Honest! There is nothing wrong with buying stones polished by efficient experts. We are not trying to talk you out of buying a nice rock tumbler - we just want you to get the best value for your money! 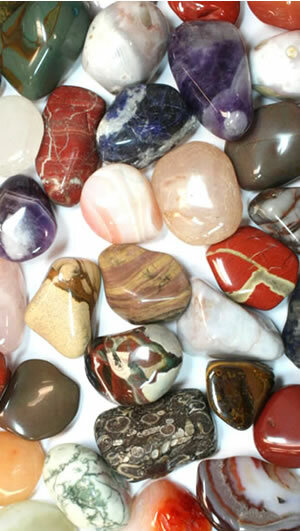 You can buy a three-pound bag of our polished stones mixtures for an average cost of under $9 per pound. And, if you buy some of our bulk tumbled stones you can get them for less than $7 per pound. You probably can't make them for that price, once you consider the cost of electricity and abrasives (in the tables at left) plus the cost of rough rock and the tumbler itself. If you decide to do these calculations, keep in mind that if you purchase 10 pounds of rough, it might yield just 6 or 7 pounds of beautiful tumbled stones! So... if what you really want is a variety of perfectly-polished stones to put on display, you'll probably save time and money by leaving the work to the professionals - and simply purchasing a bag of mixed tumbled stones. A few people have written to us about the costs of operating a rock tumbler. To respond to these questions we have prepared a detailed cost comparison for several of the most popular tumblers that we sell. Presented below are estimated operating costs for electricity and estimated costs for the grit and polish consumed. We did not include a cost for rough rock as costs vary greatly. Some people find their own rocks and some pay $30 or more per pound for exotic materials. :-) You can simply add the cost of your rough to the total operating costs presented below. These types of calculations require a lot of assumptions. We explain the assumptions that we have used in the sections below. Please feel free to do your own calculations if you prefer a different set of assumptions. Rotary tumblers operate 24 hours per day and typically run seven days a week. We were surprised when we learned how much electricity was required. To arrive at the values below we assumed an electricity cost of 11 cents per kilowatt hour and motors operating at maximum efficiency. We also assumed that a batch of rocks required 35 days in the Thumler's and Lortone rotary tumblers (we run the coarse grit step twice) and 7 days in the Lot-O-Tumbler vibratory rock tumbler. (Four days in medium, one in fine and two in polish). Your costs could be higher or lower than our estimates based upon how long you operate the tumbler, how much you pay for grit and how much you must pay for electricity. Vibratory tumblers require a lot less grit and polish when compared to rotary tumblers. We have prepared the table below to summarize these costs. For vibratory machines we assumed 1/2 ounce of grit per pound of rock for each 24 hours of operation for the coarse grind step (4 days), 1/4 ounce of grit per pound of rock for the fine grind step, and 1/4 ounce of polish per pound of rock for the final step. Finally, we assumed a cost of $4.00 per pound for coarse and medium silicon carbide grit, $6.00 per pound for fine grit, and $8.00 per pound for aluminum oxide polish. If you use different amounts of grit/polish or acquire them at a different cost you can recalculate accordingly. Our calculations show that larger tumblers generally operate at a lower cost per pound of rock. That's because they make more efficient use of electricity. Our calculations show that the Lot-O-Tumblers have the lowest operating cost for grit, polish and electric power out of all of the machines considered. The single barrel Lot-O-Tumbler produces at a cost of just $1.39 per pound of rock processed and the double barrel machine produces at a cost of just $1.16 per pound. These costs were less than half of the expense of running a rotary tumbler. We calculated operating costs by adding the cost for electricity and the cost for abrasives. We did not include amounts spent on optional tumbling media or wear and tear on the rock tumbler. 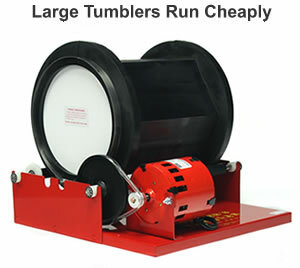 You can see that larger tumblers have the lowest operating cost per pound of rough rock and that vibratory tumblers produce tumbled stones for less than half the cost of a rotary tumbler. 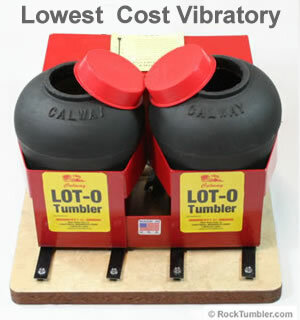 Maybe your next tumbler should be a vibratory? Our calculations show that the Thumler's Model B tumbler had the lowest operating cost for grit, polish and electric power out of all of the machines considered. It produced polished stones with an abrasive and electricity cost of just $2.35 per pound of rock processed. The savings was mainly derived by the higher barrel capacity being driven by a motor that has a power consumption that is not much more than the motor of a small tumbler. The greatest variable in the cost of producing your own tumbled stones is the cost of acquiring rough. Maybe you own a ranch in Arizona and can pick up a few pounds of rough while taking your dog for a walk. In that situation your cost of acquiring rough is almost zero. If you travel to a pay-to-dig site you have automobile costs, admission costs, along with the costs of tools and meals. If you purchase rough by mail you have the cost of the rough plus postage. These costs add up rapidly. Let's imagine that your cost of rough is $6 per pound. And, let's assume that one pound of rough will yield about 2/3 of a pound of nice tumbled stones. That means that your real cost of making tumbled stones is about $9 per pound plus the tumbling cost per pound in the table above. If you use the single Lot-o-Tumbler then your costs will be about $10.39 per pound. Which is more per pound than the cost of our tumbled stone mixtures. Those are some pretty expensive stones. We run our rock tumbler because we enjoy starting out with rough rock, using some equipment along with some knowledge and producing a product that is interesting and pretty. The cost of the stones is not important because the hobby is what we enjoy. However, if we had a craft business that required turning a profit, we would think about our needs for tumbled stones quite differently. In that situation we would either be running a really big rock tumbler for efficiency or purchasing tumbled stones by the ton from commercial tumblers.